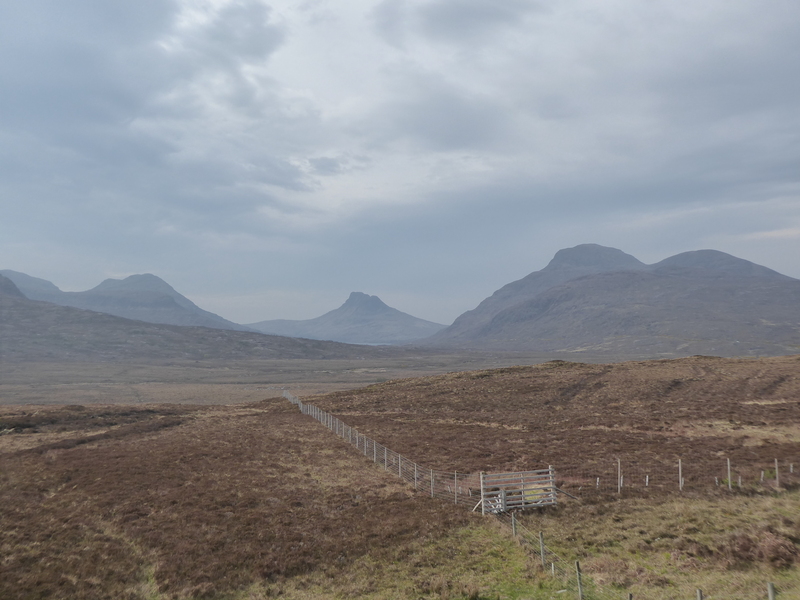 Day 7: Rhenigidale to Inchnadamph, via the Stornoway/Ullapool ferry. 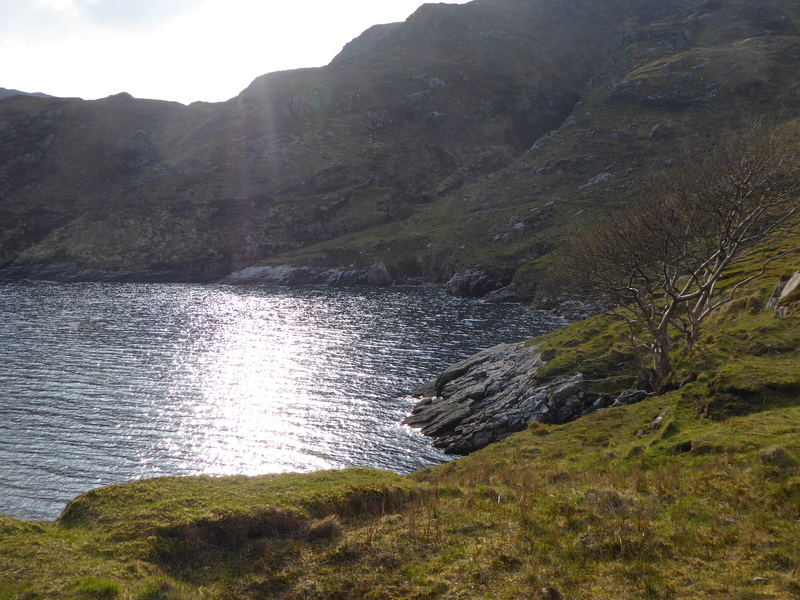 Rhenigidale hostel is by the sea, in a delightful little cove. We had a peaceful night (except for a persistent cuckoo who sang out for half the night) and left by 7.30am. The first hill hit us with a 15% climb before we had a chance to warm up (or possibly even wake up). But it was only a short amount of pain, topping out below 200m. We then dropped back to sea level as the sea loch, aptly named Loch Seaforth, twists around the hills. Rain was forecast and threatened but largely stayed away, but it was overcast. Then it was another climb up to the main road – “main” being a relative concept. 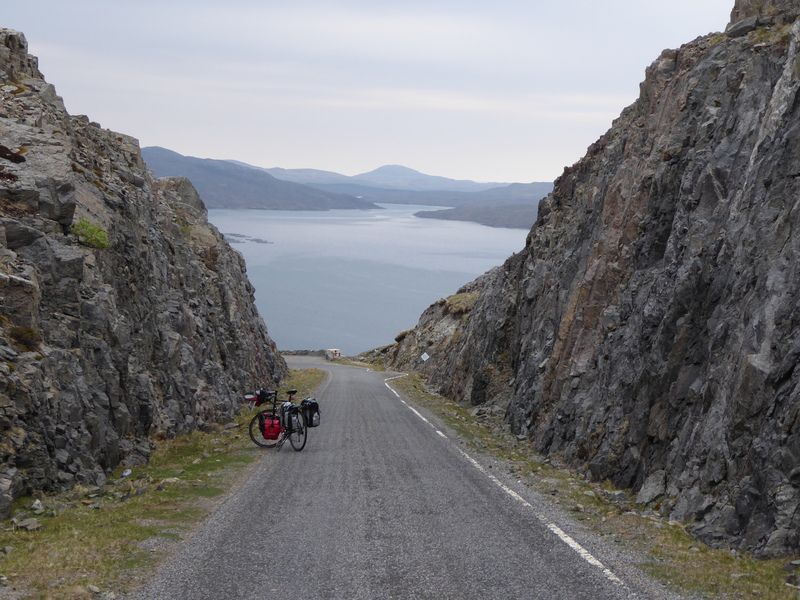 A bit more climbing and then a glorious descent to re-join Loch Seaforth. It was then up and down all the way to Stornaway. Half way along we left the “Isle of Harris” and joined the “Isle of Lewis” – but it was all one landmass. It was all very strange because neither is an island in the usual sense of the word. The scenery in north Lewis is a bit mundane – flattish peat bogs and occasional fir tree planted forests. There was the occasional bird of prey, which always dipped below the skyline when we got the binoculars out, but otherwise it was a case of covering the miles. We did pass the point where Bonnie Prince Charlie landed after the disastrous battle of Culloden which was the start of the suppression of the clans and the Highland Clearances, where sheep were more profitable than crofters for landowners. A bleak period in Scottish/English relations. We arrived at Stornoway about 11.30 for a 2pm ferry and had a pleasant few hours ambling around having coffee, exploring the town and chatting to other touring cyclists as we waited to board the ferry. The highlight of the 3 hour ferry ride was a training exercise by the coastguard who brought a helicopter to hover just over and alongside the ferry as it was going along. 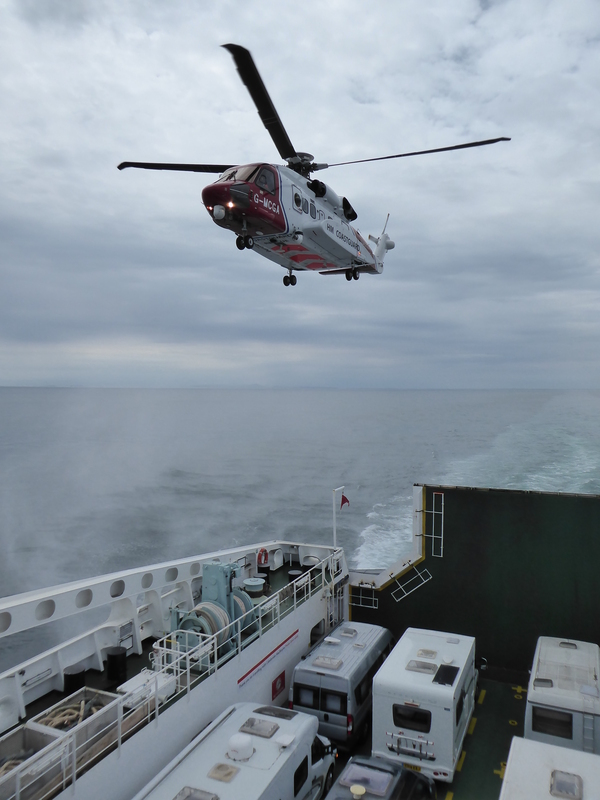 The waves were affected by the rotors as the pilot held the helicopter metres over the ferry. It was all very impressive, albeit done on a sea that was like a millpond. Arriving on the mainland again we knew we had 25 miles to reach the hostel at Inchnadamph. We left Ullapool just before 5 and plodded out of town with the sun shining but a worrying wind brewing. The wind was a north-westerly which is just what we did not want as we were going in a north-westerly direction – and is was strong. Battling against the wind is every cyclist’s pet hatred because it is relentless. It was particularly tough as we battled uphill – to the highest point of the ride so far. The scenery was jaw-droppingly beautiful and kept us going. Vast areas of barren moorland with high mountains and long ridges. Quiet but decent roads which took us over 250m high and gave up wonderful views in the evening sunlight. This far north it does not get dark until about 9.30 or later at this time of year, but the low light picked out the features of the landscape in a unique way. Eventually we reached a crest 4 miles from Inchnadamph and started to pick up speed as we descended. That was most frightening of all because the occasional gust knocked the bikes sideways by several feet. But we got there. We had planned to eat at the Inchnadamph Hotel but we told it was “residents only for food. We later found non-residents who had had a bar meal there, and that the policy seemed to vary for different people! It may have had something to do with our English accents or maybe just was a cantankerous hotel owner who only served customers he liked the look of – and after 60 miles and 1250m of climbing – it would be fair to say we were not in that category. Conversely we got a warm welcome at the hostel, bought some ready-meal lasagne and had that with salad. Ready-meals have never, never tasted so good.